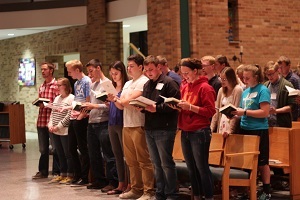 Thursday Night Liturgy, or TNL, is an informal, student-planned Mass at 9:15pm on Thursdays during fall and spring semesters. All are welcome! Do you sing or play an instrument or like to sing? Come to rehearsal at 8:15pm before TNL in the Worship Space.